Our Annual Event is the headline event for planners in the Philadelphia region. Each fall, the membership meets at this educational and networking event. AICP certified planners receive CM credits for the educational portion. Student are on hand to receive the annual John E. Pickett Scholarship awards. All members then have a chance to network and enjoy refreshments at a unique venue in the region. 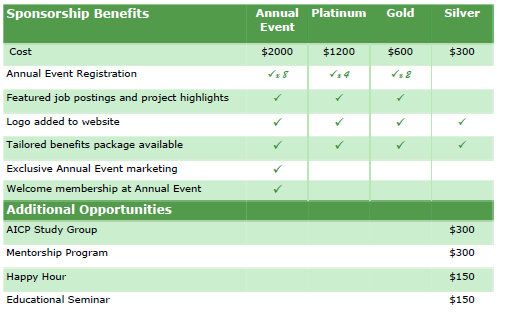 Most sponsorship levels receive tickets to the event. All sponsors are featured on this website, which receives over 44,000 website hits and an average of over 4,000 unique visitors each month! Articles are emailed to over 700 planners and colleagues every month. Our popular Job Postings section of the website has become a go-to tool for finding planning jobs in Greater Philadelphia and sponsors receive featured postings as articles on the website for greater visibility. Mentorship program sponsors reach graduate planning students in the region who are looking to learn more about the professional experience they will have after graduation. We are reimagining the program for the 2018 year!